As a historian and horror enthusiast, I am always both excited and apprehensive when a horror film draws on the byline “Based on a True Story or True Events”, as so often that true story has been warped and torn in so many ways that the truth which inspired the initial horrific reaction is muted in favour of sensationalism and loud scream-y “jump out” moments. It’s why I am a much bigger fan for movies like “Gojira” and “The Devil’s Backbone” than I am for the mistake that was “The Chernobyl Diaries.” What is worse is the fabrication of horror films based on a completely fake history, or one that takes the tragic history of an event or location and renders it trivial, hidden behind the “story” that is created based on the stories based on the real experiences. I have spent no small amount of time researching the history of such a place, that is about to reach an even wider audience that it has since the mid 1990’s and early 2000’s as a place of real tragedy. Aokigahara, known as both “The Sea of Trees” and “The Suicide Forest”, is such a place. I am fascinated by the long history of tragedy, and of cultural association with death, that the forest has endured. On the North-facing slope of Mount Fuji, arguably one of the most iconic places, both spiritually and culturally for the people of Japan, lies a forest of trees so dense and old, that getting lost and never returning from within is not only a fear, but in fact an inspiration and a lure for those who have suffered the many trials of living in the modern world. The forest has appeared in Japanese fiction, popular/pulp culture, manuals for death, and even been the subject of psychological study since the mid 20th century. Some are drawn by this very “macabre” culture, drawn by the accumulation of death and the forbidden idea. Others seek the loneliness of the forest to make their final escape from life, driven by depression, social pressure to succeed, financial hardship; it is there that they go to disappear, where the must feel that the burden they assume they carry will not pass on to others when they die. The forest also draws those who seek to help; signs caution those who seek to disappear that there are others who can help them, debt services, an ear to listen (Though mental health issues are still a major concern in Japan at this time, due both to stigma and to a lack of adequate supports within the healthcare system). Others, like Azusa Hayano, walk the forest in hopes of discovering the desperate before it is too late, to bring them back to the world and give them the help they need. However, there is a large chance that, venturing far enough into the densely packed forest, they will instead encounter the long missed remains of the very ones they want to help. Shoes, empty bottles and pill packets, and ropes are among the foliage. Where they cannot help the living, there are those who would seek to help the dead; Buddhist monks often dedicate time to walking the forest, either between the trees or around the perimeter, to pray for those departed, to offer their spirits a proper mourning, so that they will not return as ghosts to lure more individuals into the lullaby of death. Since 2010, American producers and directors have released no less than 4 films which focus on Aokigaraha; all but one of these films is from the horror genre (Notably, 2015’s Gus van Sant film “The Sea of Trees”, seeks a different dramatic approach to the forest, and what it represents). Conversely, the most apparent title from Japan was released in 2013, titled “Aokigara”, and directed by Taku Shinjou, is also a drama/mystery, rather than a horror film. Coming alter this week is another addition to the horror genre’s repertoire starring Aokigahara. “The Forest“, directed by Jason Zada, written by Ben Ketai, Nick Antosca, and Sarah Cornwell, and staring Natalie Dormer, is set to be released to North American theatres on January 8th, 2016. While The United States’ Golden Gate Bridge is similarly infamous as a site for suicide, it has already received a rather intimate treatment as a documentary, while Aokigahara seems to feature more prominently in North American films as a “spooky haunted place of supernatural proportions. While the intersection of horror and history is always interesting, there is something to be said about knowing the real history, and the cultural and social role that such places and stories have. Above everything, Aokihgahara is a place of tragedy, A place that must be understood, based on its long history in association with death and suicide. To merely see it as a “spooky forest”, a “supernatural hive of evil” or “that place where people go to kill themselves”, is a mistake. Aokigahara is much more, and its story should not be swept under the rug of theatrics and superficial scare moments and special effects (I can’t say anything for the movie plot itself yet, as I have not had the chance to see it, though I likely will see it shortly after release). While it is true that there are many who have ventured into the forest and never returned or been found, we cannot forget that they went to disappear, that they felt it was their last option. It must be remembered that this is not merely a place where the trees grow so close together that it is easy to lose your way, that without the proper navigational equipment you may be going in circles, or where the wind blowing through the branches may seem to call out for others to join the countless others who have walked through the trees before. It is a place of dep spiritual connection, of desperation, and of tragedy and loss. It indicated and highlights serious social issues, and as such is a serious place, that must be given the respect it deserves. Be warned, some might find this topic difficult to deal with, and this research is still in progress, as much of the more recent sources for historical comparison are not readily or easily obtainable. If the history of Aokigahara as a spiritual place, or as a suicide pilgrimage point does not interest you, I encourage you instead to watch either one or both of the documentaries linked at the bottom of the post, as they are informative both on the subject of Aokigahara, and the reality of suicide in Japan. For the Japanese, Mount Fuji is a place of cultural and spiritual memory; it is the most recognized symbol of Japanese culture, and a spiritual beacon shrouded in mythology, mystery, and beauty which is unlike any other place in the world. In her late 19th Century travel letters, Isabella Bird described Fuji as a mountain of lonely majesty, and reports that she understood why it was so spiritually and culturally valued by the Japanese.1 While Mount Fuji is an awe-inspiring representation of natural beauty, it is not alone in the Fujigoko area in having a sacred identity. Caressing the North-Western flank of the mountain rests the 3,500 hectare forest of Aokigahara-jukai,2 called the Sea of Trees, but more popularly documented as ‘The Suicide Forest’. 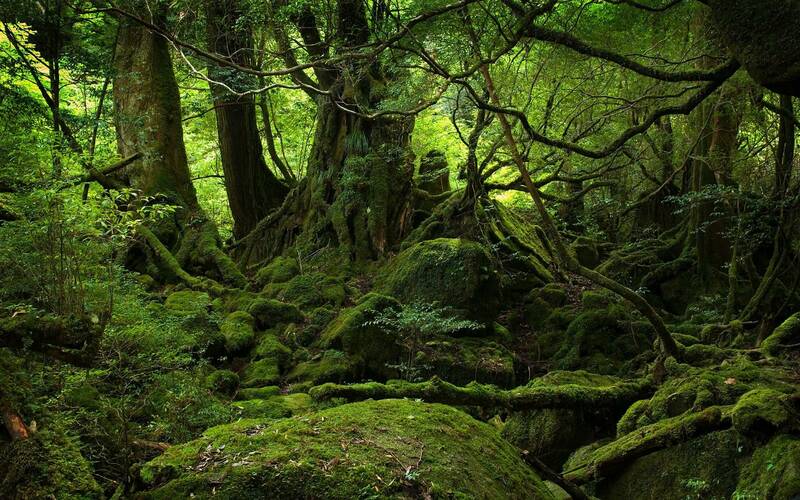 Aokigahara is a place that has been shaped as much by its spiritual associations as by its actual history. 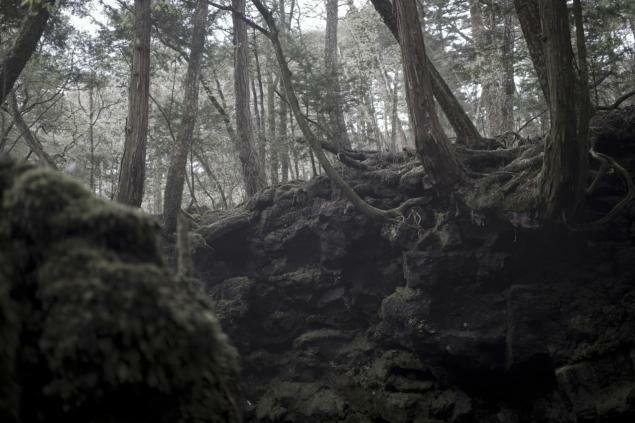 Left untouched by the push for Japanese modernity,3 Aokigahara has become the terminus for a macabre pilgrimage tradition, where despair and an eerie sense of foreboding permeate the atmosphere. Long associated with demons and yurei (ghosts),4 since the 1970’s the forest has become an infamous locale where weary Japanese venture in order to end their lives. Scholarly documentation concerning Aokigahara is sparse in comparison to the research that has been done concerning the spiritual and historical role of Fuji, but there is a strong cultural and spiritual connection between these two spaces. Aokigahara shares in Fuji’s sacred identity in a very interesting manner, and also has its own associations with cultural memory that make it a pilgrimage location in its own right. However, while Fuji could in all likelihood continue to thrive and exist without the presence of Aokigahara, it might be argued that the forest requires the mountain in order to retain its identity and to be understood as a meaningful cultural space. However, due to the vast number of suicides, as well as the haunting atmosphere of the forest itself, Aokigahara has come to be considered the most haunted space in all of Japan.5 Fuji and Aokigahara are a linked space not only due to their proximity, but also because of shared history and the translocation of sacred identity. As will be argued, this allows such polar opposites of beauty and the macabre to be juxtaposed. Fuji and Aokigahara are two sides of the same coin; both are locked in cultural memory and steeped in spirituality, despite the differences in their individual identities. Understanding Aokigahara-jukai’s appeal as a site of fatalistic pilgrimage first requires an investigation Fuji’s cultural identity as a sacred space. This will be achieved by looking at the sacred value of mountains in the Japanese culture, and particularly at the history of Fuji as a sacred space associated with death. Next, the concept of pilgrimage and the attitudes in regards to suicide in the Japanese culture will be examined. Finally, a closer look at the history of Aokigahara-jukai will reveal how history and association have shaped the forest into a pilgrimage site in Japanese cultural memory. Aokigahara provides pilgrims with a private space which Fuji, as a highly trafficked destination for both foreign tourists and Japanese, cannot. The forest is a sacred space, steeped in cultural memory, and creates a private locale where distraught, desperate, and despondent individuals can completely disappear. The sacred and spiritual identity of Fuji was established by Shinto and folk tradition, which are based largely on reverence for nature and the natural world. Later, Buddhist practices in the area reinforced this sacred reverence by linking both the Buddhist paradises of Dainichi and Amida to the peak of the mountain.8 In establishing an understating as to why mountains, in particular Fuji, play such a role in Japanese spirituality, Edmond Rochedieu’s text Le Shintoïsme cites two important principles. First, Rochedieu states that the religious value of any mountain is based on its presence in daily life and practices.9 Considering that Japan’s geography is 70% mountainous,10 and that Fuji is still visible from Tokyo barring certain atmospheric conditions,11 it is not difficult to understand how mountains would take on a role of great sacred and spiritual power in early folk practices. A triumvirate of sacred association exists between Mount Fuji, Buddhist Bodhisattva’s,12 and Japanese kami. These associations allowed Fuji to retain its unique sacred and national identity in cultural memory despite the fluctuations in belief and national political sentiments over the course of Japan’s modernization.13 This can be argued to make Fuji a space which exists both in the capacity as a provider of identity, as well as a deeply important sacred icon, for the people of Japan. Most importantly for the translocation of the sacred identity of Fuji onto Aokigahara, Rochedieu emphasizes that mountains were perceived as locations where it was possible to invoke the souls of the deceased.14 In the vicinity of Fuji, a place that also exists outside the mundane world, such a belief is supported by mythology, folk practices, and religious traditions. This triumvirate served to establish Fuji as a pilgrimage destination early on, as it provided the necessary spiritual, religious, and environmental connections. There are many small shrines dotting the area,15 in addition to the purification lakes used by those making the traditional Fuji pilgrimage.16 The whole area offers a great spiritual security, and can be understood as affirming a sense of belonging to the larger identity of Japan. However, the mountain itself is an open space, offering little privacy. Because of this lack of privacy, Fuji itself is not able to provide the proper atmosphere for the ultimate and final pilgrimage of one seeking to take his or her own life. Byron Earhart’s Mount Fuji: Icon of Japan says that “through history Fuji has been celebrated more as a religious or sacred site and as a cultural and aesthetic ideal.”17 Social and religious history in Japan supports a wide variety of pilgrimage concerns, ranging from leisure pursuits to self-sacrifice. Also, pilgrimages of self-sacrifice are well documented in the history of Fuji. Take for example Jikigyo Miroku. He was the leader of a Fuji-centric Buddhist sect in the Edo period, and within his sect promoted Mount Fuji as “the pivot-stone of the Three Lands,”18 increasing its spiritual and cultural importance to a new level. Based on the idea that Mt. Fuji is the fulcrum of China, Japan, and India, Miroku scripted his suicide, planning to make the ultimate pilgrimage to the summit of Fuji. However, such action was forbidden by the shrine in control of the summit, Sengen in Fujinomiya, due to a spiritual concern that such a death would pollute and defile the purity of the mountain.19 With his original plan thwarted, Miroku chose instead to establish himself in a cave on the Northern slope of the mountain, above the Eboshi-iwa, or 7th station, facing the forest of Akiogahara.20 In 1733, Miroku committed himself to thirty-one days of fasting and meditation, and died as he had predicted.21 This choice of location is interesting, as it resembles a similar religious sacrifice which took place much earlier, inside the forest of Aokigahara. Historically, religious deaths, especially suicides and sacrifices by Buddhist teachers, were seen to “sever as models on which future deaths might be patterned.22 Based on this idea, it can be argued that since Miroku’s time the spiritual associations connected to Fuji have continued to evolve, with the mountain serving equally as a symbol of the sacred and place of cultural memory, as well as a beacon for the ideal death, as its connection with suicide, especially suicides committed for the salvation of others, dates back centuries. When looking at the nature of pilgrimage traditions, it is important to note that the summit of Fuji is not always the ultimate goal, or the most significant space; the true goal of any Japanese pilgrimage lies in achievements of a more spiritual nature,23 and relies on the experience of some sort of cathartic personal realization.24 In addition, Buddhist thought dictates that the nature of a location in the natural world can aid in the escape from an aggressive karmic cycle.25 Because the forest is closely connected to Fuji, as well as an untouched piece of the natural world, Aokigahara-jukai is tantamount to a true pilgrimage; it is a sacred area associated with and sharing in Fuji’s identity, but designed to meet a different cultural and spiritual need. Where Fuji is a public space, Aokigahara has a haunting and intimate sense of privacy, as noted by those who venture into the forest as ‘tourists’, or to seek out the bodies of the dead. When examining the fatalistic pilgrimage made to Aokigahara annually by dozens of Japanese,26 there are three additional mitigating factors which serve to validate the forest as a culturally and historically informed choice. The first is the Japanese attitude towards suicide. The second is the historical memories and religious ideas associated with death and Aokigahara. Finally there are contemporary influences, and physical geography which play a large role in perpetuating the individual identity of Aokigahara. Based on these factors, Aokigahara-jukai’s pilgrimage tradition, though macabre, can be shown to be rooted in history and ingrained in the cultural memory of the Japanese. 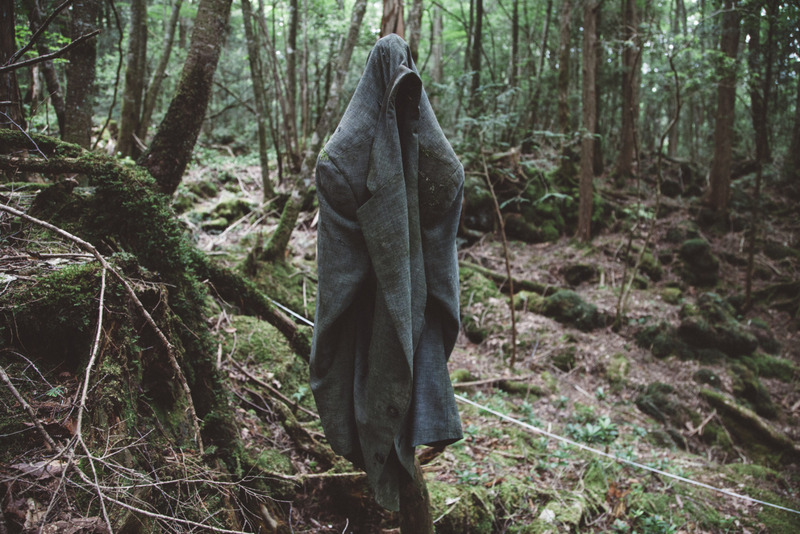 Aokigahara is culturally connected with death, stemming from religious practice as well as local history. The first documented suicide in Aokigahara occurred four centuries prior to Miroku’s pilgrimage on Fuji. In 1340, a Buddhist monk named of Shohkai entered a cave within Aokigahara and began his ritual fast, saying that his sacrifice would liberate the people from their karmic transgressions.38 The records indicate that Aokigahara-jukai possesses its own deeply rooted cultural memory as a sacred pilgrimage location. Due to the number of important similarities, Shohkai’s actions can be argued to have influenced those later taken by Miroku: both men were devote Buddhist monks, chose the Northern area of Fuji, and committed their suicide through ritual fasting. It is important to note that there were many other religious suicides committed in such a manner.39 These religiously oriented suicides can be seen to serve as yet another justification for the pilgrimage to Aokigahara-jukai. The notion of karmic release from a sinful world,40 as created by these religious teachers, can be argued to strengthen the cultural memory of the forest as a place of great spiritual power. While religious suicides are individually documented, Aokigahara was also the resting place for many rural and peasant people during the Sengoku Jidai (the Warring States Period; 1467-1603).41 War and bitter famine were common during this period, and it was to Aokigahara and the foot of Fuji that people brought the old and young who they could not feed.42 They hoped that through their sacrifice, the spirits would find rest and pacification in nature. This type of behaviour gave rise to Aokigahara’s ghoulish infamy as a haunted space, and is believed to have created a cyclical vortex of the dead drawing the living to final repose.43 As will be shown next, this historical association has largely influences to the manner in which contemporary media and art treats Aokigahara-jukai. temporary alters in order to make offerings to pacify the spirits, and walk the woods in hopes that one day the spirits will stop drawing people to making this fatal and final pilgrimage.51 Journalists who have ventured in the Aokigahara often speak of the position in which bodies are found; while some hang from the tress, others are on their knees,52 a position associated with spiritual thought, and Buddhist meditation. Popular media has played a role in the perpetuation of the social memory and associations of the Aokigahara pilgrimage. In 1960, author Seicho Matsumoto released his novel Nami no Tou, or Tower of Waves, in which the heroine makes a final trek into Aokigahara for the purpose of committing suicide.53 It is interesting to note that Matsumoto’s most controversial piece has been adapted for television multiple times since the 1970’s, echoing the fact that suicide in Aokigahara is still prevalent in Japan. In 1993, Wataru Tsurumi’s self-help book, Complete Suicide Manual, called Aokigahara the perfect place to die; this book has since been found with many bodies during the annual search of the forest.54 The appeal of Aokigahara-jukai is in the associated history of suicide, the proximity to a place of great spiritual importance, as well as the nature of the forest itself; Aokigahara is not on the agenda for innocent leisure hikes, family trips, or sightseeing due to the high probability that a scene of a past suicide will be discovered.55 There is a loneliness to Aokigahara, and a sense of belonging to something larger than self.56 This loneliness, previously attributed to Fuji by Isabella Bird, can be argued to provide a sense or separation from the mundane world, while establishing a strong connection to the sacred past and cultural memories. Cultural memory, history, and spirituality have all been factors in the creation and perpetuation of the Aokigahara-jukai pilgrimage. The forest presents an accessible and acceptable alternative to Mount Fuji; the forest shares in part of Mount Fuji’s sacred and cultural identity, and exists as a spot steeped in cultural memory. Aokigahara-jukai builds on the majestic loneliness ascribed to Fuji, and allows for pilgrims to find a deep association with Japan and Fuji’s deeper sacred aspects. While the prospect of a pilgrimage for the purpose of suicide is macabre, its existence is not only supported by historical predecessors, but it also served a require social function. Takahashi’s interviews with survivors of Aokigahara support his idea of psychogenic amnesia, by which he means that the trauma of the suicide attempt has caused the individual to be unable to recall their motivation.65 However, there are some survivors who site debt, depression, and anxiety due to the excessive social pressure to succeed as their reasons for attempting suicide within the forest.66 Though the inhabitants of local area towns express a desire for journalists to look beyond the macabre nature of the forest,67 there is still very little material in the media concerning the forest as a site of natural beauty. Aokigahara-jukai becomes much more than a lonely and beautiful forest at the foot of Mount Fuji, chosen due to its seclusion and infamy; it has become a refuge where connection can be established to cultural identity, and a sensation of belonging can be achieved. 1Isabella L. Bird, Unbeaten Tracks in Japan (San Francisco: Traveller’s Tales, Inc., 2000 ), 2. 2Peter Hadfield, “Japan Struggles With Soaring Death Toll in Suicide Forest.” The Telegraph (Nov. 5, 2000). 3Yoshitomo Takahashi “Aokigahara-jukai: Suicide and Amnesia in Mt. Fuji’s Black Forest.” Suicide and Life Threatening Behaviour, Vol. 18 Issue 2 ( Summer 1988), 165. 4Zack Davisson, “The Suicide Woods of Mt. Fuji.” SeekJapan. 6Byron Earhart, Mount Fuji: Icon of Japan (Columbia: The University of South Carolina Press, 2011), 129. 8Byron Earhart, Mount Fuji: Icon of Japan, 27. 9Edmond Rochedieu, Le Shintoïsme (Paris: Cercle du Bibliophile, 1968), 76. 10Tobira: Gateway to Advanced Japanese Learning Through Content and Multimedia, 2nd Ed (Tokyo: Kurosio Publishers, 2010), 4. (Cambridge: Cambridge University Press, 2009), 9. 12Byron Earhart, Mount Fuji: Icon of Japan , 7. 14Edmond Rochedieu, Le Shintoïsme, 76. 15“Japan’s Harvest of Death.” The Independent (Tuesday October 24, 2000). 16 Earhart, Mount Fuji: Icon of Japan, 7. 17 Earhart, “Preface: Invitation to Fuji.” Mount Fuji: Icon of, XVII. 18 Earhart, Mount Fuji: Icon of Japan, 55. 22Bryan J. Cuevas, and Jacqueline I. Stone, “Introduction.” The Buddhist Dead: Practices, Discourses, Representations (Honolulu: University of Hawai’i Press, 2007), 19. 23 Earhart, Mount Fuji: Icon of Japan, 143. 24Antonio Santos, “Hiroshima, mon amour: An Inner Pilgrimage to Catharsis.” Pilgrimages and Spiritual Quests in Japan, eds. Maria Rodriquez del Alisal, Peter Ackermann, and Dolores P. Martinez (New York: Routledge, 2007), 131. 25 Peter Ackermann, “Pilgrimages in Japan: How far are they determined by deep-lying assumption?” Pilgrimages and Spiritual Quests in Japan, 99. 26Laura Sesana, “Aokigahara, Japan’s Suicide Forest.” The Washington Times Communities. ( August 19, 2012). 27Rob Gilhooly, “Inside Japan’s ‘Suicide Forest.” The Japan Times Online (January 26, 2011), 2. 28 Edmond Rochedieu, Le Shintoïsme, 184. 29 Boyé Lafayette De Menth, Japan Unmasked: The Character of Culture of Japan (Singapore: Tuttle Publishing, 2005), 94. 30 Whether a myth or reality, the practice of ubasute (Parent abandonment) exists, whereby a family member, elderly or infirm, would be left or sacrifice themselves to a mountain or forest to slowly die in times of starvation and drought in order to alleviate the burden they placed on their families. The Ballad of Narayama (1968 dir. Keisuke Kinoshita, 1983 dir. Shohei Imamura) depicts a mother encouraging her son to help her sacrifice herself on a mountain so that she will no longer be a burden. 31 Louis G. Perez, The History of Japan, 2nd Ed. (Connecticut: Greenwood Press, 2009), 212. 32“Japan’s Harvest of Death.” The Independent (Tuesday October 24, 2000). 33 Gilhooly, “Inside Japan’s ‘Suicide Forest”, 2. 36Yoshitomo Takahashi, “Aokigahara-jukai: Suicide and Amnesia in Mt. Fuji’s Black Forest” Suicide and Life Threatening Behavior, Vol. 18 Issue 2 (Summer 1988): 172-173. 37D. Max Moerman, “Passage to Fudaraku: Suicide and Salvation in Premodern Japan” The Buddhist Dead: Practices, Discourses, Representations, 285. 38Yoshitomo, “Aokigahara-jukai: Suicide and Amnesia in Mt. Fuji’s Black Forest,” 165. 44Gilhooly, “Inside Japan’s ‘Suicide Forest.”, 2. 45“Japan’s Harvest of Death.” The Independent (Tuesday, October 24, 2000). 47Lafcadio Hearn. In Ghostly Japan (Rutland: Charles E. Tuttle Company, 1971 ), 238. 48Otsuka Eiji, “Delivery #4: Waltz” in The Kurosagi Corpse Delivery Service Vol. 3 (Milwaukie: Dark Horse Manga, 2004), 141-191. 49 Gilhooly, “Inside Japan’s ‘Suicide Forest”, 1. 50 Moerman, “Passage to Fudaraku: Suicide and Salvation in Pre-modern Japan”, 267. 51 Gilhooly, “Inside Japan’s ‘Suicide Forest.”, 1. 53Yoshitomo, “Aokigahara-jukai: Suicide and Amnesia in Mt. Fuji’s Black Forest”. 166. 55Gilhooly, “Inside Japan’s ‘Suicide Forest.”, 1. 56Yoshitomo, “Aokigahara-jukai: Suicide and Amnesia in Mt. Fuji’s Black Forest,” 174. 57 Gilhooly, “Inside Japan’s ‘Suicide Forest.”, 1. 58Yoshitomo, “Aokigahara-jukai: Suicide and Amnesia in Mt. Fuji’s Black Forest,” 165. 59“Japan’s Harvest of Death.” The Independent (Tuesday October 24, 2000). 60Yoshitomo, “Aokigahara-jukai: Suicide and Amnesia in Mt. Fuji’s Black Forest,” 165. 62“Japan’s Harvest of Death.” The Independent (Tuesday October 24, 2000). 63Zack Davisson, “The Suicide Woods of Mt. Fuji.” SeekJapan. 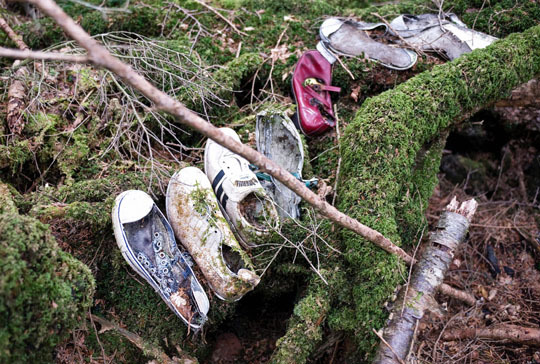 64Laura Sesana, “Aokigahara, Japan’s Suicide Forest.” The Washington Times Communities. ( August 19, 2012). 65Yoshitomo “Aokigahara-jukai: Suicide and Amnesia in Mt. Fuji’s Black Forest,” 167-173. 66Gilhooly, “Inside Japan’s ‘Suicide Forest,” 1-2. Ackermann, Peter. “Pilgrimages in Japan: How far are they determines by deep-lying assumption?” Pilgrimages and Spiritual Quests in Japan. ed. Maria Rodriguez del Alisal, Peter Ackermann, and Dolores P. Martinez. London: Routledge, 2007. pp. 97- 106. Bird, Isabella L. Unbeaten Tracks in Japan. San Francisco: Traveller’s Tales, Inc., 2000 . The Cambridge Encyclopedia of Japan. ed. Richard Bowring, and Peter Kornicki. Cambridge: Cambridge University Press, 2009. Cuevas, Bryan J, and Jacqueline I. Stone. “Introduction.” The Buddhist Dead: Practices, Discourses, Representations. Eds. Bryan J. Cuevas, and Jacqueline I. Stone. Honolulu: University of Hawai’i Press, 2007. pp. 1-31. De Menthe, Boyé Lafayette. Japan Unmasked: The Character & Culture of the Japanese. Singapore: Tuttle Publishing, 2005. Earhart, H. Byron. Mount Fuji: Icon of Japan. Columbia: The University of South Carolina Press, 2011. Hearn, Lafcadio. In Ghostly Japan. Rutland: Charles E. Tuttle Company, 1971 . “Japan’s Harvest of Death.” The Independent. Tuesday, Oct. 24, 2000. Moerman, D. Max. “Passage to Fudaraku: Suicide and Salvation in Premodern Japanese Buddhism.” The Buddhist Dead: Practices, Discourses, Representations. Eds. Bryan J. Cuevas and Jacqueline I. Stone. Honolulu: University of Hawai’i Press, 2007. pp. 266- 296. Otsuka, Eiji. “Waltz.” The Kurosagi Corpse Delivery Service Volume 3. Milwaukie: Dark Horse Manga, 2004. Perez, Louis G. The History of Japan. 2nd Ed. Connecticut: Greenwood Press, 2009. Santos, Antonio. “Hiroshima, mon amour: An Inner Pilgrimage to Catharsis.” Pilgrimages and Spiritual Quests in Japan. eds. Maria Rodriguez del Alisal, Peter Ackermann, and Dolores P. Martinez. London: Routledge, 2007. pp. 130-137. Takahashi, Yoshitomo. “Aokigahara-jukai: Suicide and Amnesia in Mt. Fuji’s Black Forest.” Suicide and Life Threatening Behaviour. Vol. 18. Issue 2, 1988. pp.164-175. Tobira: Gateway to Advanced Japanese Learning Through Content and Multimedia. 2nd Ed. Tokyo: Kurosio Publishers, 2010. This year is a very important year; it marks the 100th anniversary of the start of World War I. Throughout the year, schools, museums, and a variety of other institutions have been hosting lectures and exhibits with the focus of remembering the Great War, those who fought, and the changes which it caused. Passchendaele was one of the definitive battle of World War I, especially for the Canadian soldiers who had answered both the call to serve their country and to serve the British Empire. Against great adversity, the Canadian troops came to be known as the best shock troops on the Western Front, breaking lines that neither the French nor British troops had been able to. Passchendaele was also one of the bloodiest confrontations; known as the Third Battle of Ypres, the landscape had been torn apart by the artillery shelling from both sides. This, paired with heavy rain, left the battle field a muddy landscape of broken and skeletal trees, and pits filled with water, mud, and blood. I prepared this research presetation a couple of years ago when taking a graduate level course on Canada’s involvement in World War I, both on the Western Front and on the home front. Find in it an overview of the Canadian role at Passchendaele, the realities of war, first hand accounts of the battlefield, the goals, and the outcomes, links to archival and historical information, and links to further video information. Clicking on the link below with download a .pdf file of the presentation. As a Canadian, this particular battle strikes a chord of pride and sorrow within my memory; many lives were lost, and yet in the end there was a triumph (of sorts), when the Canadian troops managed to reclaim the town of Passchendale. On this day, which saw the end of the war in 1919 (well, the Armistice, which led to the signing of the Treaty of Versailles and the official end of the war), I would like you all to take a moment to either re-learn, or to learn for the first time, about the sacrifices made in World War One. While we choose this day, the 11th of November, to commemorate all soldiers who have made the sacrifice for their country, I would like us to also remember the initial reason for the commemorative ceremonies which take place on this day. For Canada, World War I was a watershed moment, an event which proved that we could stand toe to toe with the world and its problems, and that we could do it in a way which could make our country, our citizens, and our allies proud. To learn more about Canada and World War I, especially the lives of those who came from my hometown, I would suggest reading For All We Have and Are: Regina and the Experience of the Great War by Dr. James Pitsula. He is a wonderful historian, and a truly wonderful man, and I have had the fortune to have been both his student and his Teaching Assistant.